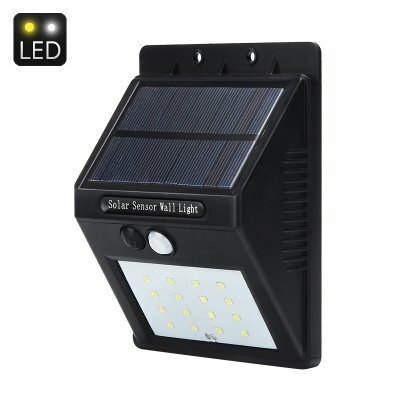 Successfully Added Solar Powered Outdoor LED Security Light - 320Lumen, 2200mAh Battery, 5.5V Solar Panel, PIR Sensor, 12 Hours Operation to your Shopping Cart. This wireless outdoor security light is quick and easy to install. Powered by the sun it requires no wiring, making it quick and easy to install. Just mount the security light so it can cover the area you desire and its in a location that will get plenty of daytime sunlight. The polycrystalline 5.5 Volt solar panel will recharge the 2200mAh battery throughout the day which can bring up to 12 hours of operating time when fully charged. Using a PIR (Passive infra red) sensor this outdoor LED light is trigger by infra red radiation in the form of heat. This means it won't be needlessly activated by blowing leaves on those windy nights. Covering a 90 to 120 degree angle the PIR sensor can pick up movement up to 3 meters away and the night sensor ensures it will only become active in low light or at night. Great for lighting up gazebos, pathways, doorsteps and patios this LED light ensure you'll have great visibility outside and no intruders will be able to sneak on to your property. Allowing you to make full use of your outdoor spaces after the sun goes down this powerful outdoor LED light will bring you plenty of light for utilizing patios, hot tubs, gardens and gazebos all night long. This Outdoor LED Security Light comes with a 12 months warranty, brought to you by the leader in electronic devices as well as wholesale LED lights.. Please install the device facing the sun. Make sure turn on the power switch before using. Keep the lights away from fire or any other source of heat.